NASA Kennedy Space Center employees and their families gather around 'Optimus Prime' in this snapshot taken during a photo opportunity Oct. 8, 2010 after the Transformer cars were used to film scenes of the new "Transformers: The Dark of the Moon" film at the space center. Optimus Prime and other robot Transformers – in their car disguises – descended upon NASA's space shuttle launch site in Florida this month to shoot scenes for their third, and reportedly final, live action movie due out next summer, called "Transformers: The Dark of the Moon." The timing of the shoot offered director Michael Bay the chance to film the space shuttle Discovery standing tall on its launch pad where NASA rolled it out a month ago in preparation for a Nov.1 blastoff. NASA officials cannot confirm that Bay in fact filmed the shuttle, or what sort of action (read: battle sequences) might unfold at the spaceport after digital effects get added in post-production. At any rate, the space center may feature prominently in the all-but-assured Hollywood blockbuster that may even, according to some talk, reveal the space shuttle itself as a mighty Transformer. The Transformers films are based on the 1980s cartoon series of the same name, which featured well-intentioned robots – the Autobots – in a war against the evil Decepticons. Earth serves as their battleground. NASA has launched spacecraft for over 40 years from the Kennedy Space Center, and the agency welcomes the publicity that the new major motion picture brings to the facility and the space program. "It's an opportunity for us to show ourselves to an audience we wouldn't necessarily always get an opportunity to show ourselves to," NASA spokesperson Allard Beutel told SPACE.com. The two previous "Transformers" movies raked in megabucks overseas, so the potential for a worldwide audience has Beutel excited. "In reality, [Transformers] is a science-fiction action film, but for us we do real space-exploration, science-fact stuff," Beutel said. "It's a chance for us, if a kid sees a NASA facility, sees the space shuttle on the launch pad, maybe they'll look into that, maybe they'll go to NASA.gov and see what's going on." The NASA spaceport has also been featured prominently in other science fiction blockbusters as the launching ground for the asteroid-smashing Earth rescue spaceships in "Armageddon" and the site of the first Machine built in the film "Contact" based on the novel by astronomer Carl Sagan. Bay has said in interviews that the third Transformers film will hearken back to the space race between the United States and the former Soviet Union. The director has hinted that the trilogy's warring extraterrestrial robots will turn out to have played a significant behind-the-scenes role in mankind's entering the final frontier. Journalists on hand at Kennedy Space Center last week for the delivery of cargo to Discovery reported seeing some of the movie's stars, including Shia LaBeouf, John Turturro and Rosie Huntington-Whiteley, who replaces Megan Fox from the previous two films as the love interest for LaBeouf's character, Sam Witwicky. Beutel said that some 600 space center employees auditioned as extras per the moviemakers' desire for realism in depicting NASA operations and personnel. "[Bay] likes to cast extras in roles who are familiar with the venue they are in," Beutel said. "They work there and are actually experts, so it's 'act like a rocket scientist,' and they'll have rocket scientists on the set." Last Friday (Oct. 8), some NASA staff and their families got to check out the real-life vehicle versions of Optimus Prime, the Olympian-voiced leader of the heroic Autobots, and Bumblebee, the loyal protector of Witwicky. Optimus Prime's famous earthly disguise is an eye-catching, chromed-out, deep blue-and-flame-colored semi-trailer truck, while Bumblebee masquerades as a sporty yellow-and-black Chevy Camaro. Beutel and other observers noticed various other vehicles cruising around the space center, including tricked-out, rally car-style racers, any or all of which might portray more-than-meets-the-eye Transformers onscreen. Helicopters swooped over the spaceport as well, likely recording the vertigo-inducing camera pans that director Bay has established as a hallmark of summer movie fight scenes. As for the rumors of NASA's iconic shuttle morphing into a colossal robot, fans of the Transformers mythologies need to look no further than Astrotrain, an evil Decepticon that can assume the form of the space shuttle as well as a steam locomotive. Beutel said he recalls Astrotrain well from his childhood, though he does not know – and even if he did, he could not say per contractual agreements with the filmmakers – if Discovery duplicitously turns out to be this menacing machine. 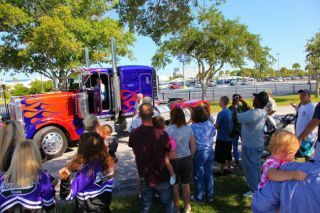 Regardless, Beutel looks forward to seeing the movie when it hits theaters and enjoyed having "Transformers" come to KSC. "It's cool having a touch of Hollywood here on the Florida Space Coast," he said.